Douglas Lwanga (centre) poses with NBS TV managers. Courtesy photo. 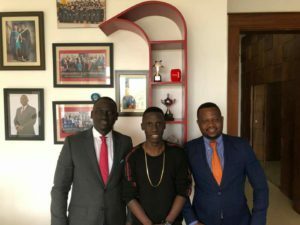 Television show host Douglas Lwanga has joined NBS TV, ending weeks of speculation over his next move after leaving NTV where he was hosting the daily programme known as “NTV The Beat,”. Douglas, who previously worked for Record TV, denied being fired from NTV despite rumors circulating that he was a victim of the company’s ongoing restructuring programme. But on Thursday, the rumours were put to rest when NBS on its Facebook page, announced that Lwanga is joining the station. “Welcome to the winning team Lwanga Douglas,” read the post that also feautured a picture of Lwanga posing with NBS managers. Douglas went ahead and promised his fans that something new is on its way and they should not worry.